There are different types of dissolution test apparatus used for dissolution test as per USP. Details are described here. Drug dissolution testing is usually used on a regular basis in the quality control department of any pharmaceutical company. This method is used to monitor the quality of the capsules and tablets that are produced. A drug can only go into the market if only it passes a dissolution test and is approved. It comprises of borosilicate glass and holds a capacity of up to 1000 ml. The shape is semi-hemispherical at the bottom while its shaft is made out of stainless steel. The shaft holds the cylinder basket. It is usually referred to as rotating basket because it rotates smoothly and its rotating speed must be in form with the recommended USP. The common speed limit is 100 rpm. It is used for capsules or tablets, suppositories, floating dosage forms and a delayed release. This apparatus is specially made and it comes with a coated paddle that reduces the disturbance from the stirring. Apparently, it has a blade that comes in contact with the bottom of the shaft. The Paddle apparatus is designed from stainless steel. It also has a platinum wire that protects the capsules from floating. The paddles motor speed is usually at 40 and the paddle is kept at 37 C. The paddle is kept in the position that specified in the current USP. It has a motor speed of 50 rpm for capsules while it is 25 rpm for suspensions. 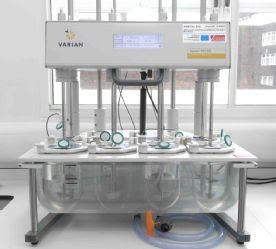 This dissolution apparatus is usually considered in product development for controlled release preparations. The reason for this is aid the release of products in GI tracts by exposing them to various physicochemical conditions and mechanical conditions. It is an easy .method for drug testing and it does not pose any problem with the PH values of its solutions. It is used for extended release, chewable tablets. It is made of two types which are the open system and the closed system. The open system has fresh medium pumped through the cells and then the fractions received. The fractions are usually drawn every 30 minutes. The dissolution test conducted with this apparatus should be conducted in the best sink conditions available. The closed system, on the other hand, is where the medium is pumped into the circle but not replaced by a fresh medium. It is normally used for drugs with a low dosage and the test is conducted in small volumes. The flow through the cell apparatus is designed like a reservoir and is commonly used for implants. It has a shaft and also has a disk assembly that can hold the product in a way that the surface will be leveled with the paddle. The paddle is joined with the disk assembly. Its volume capacity is 900 ml. It uses a vessel instead of a basket cylinder and it also has a cylinder made out of stainless steel. The apparatus is placed on cuprophan to follow the cylinder. The dosage quantity is placed inside the cylinder and it would be extracted from outside into the water bath. The problem with this drug testing dissolution is that the transdermal patches cannot be cut to a smaller size. This apparatus has a flat bottom cylinder shaped vessel with a volume capacity of 50-200 ml. It is usually placed on a disk shape holder. It also produces transdermal patches and the dosage quantity is extracted in the water bath. It is used for controlled release formations and only applies to small dosages.